Incorporated in the year 2010, we, D G Prints Fab, are one of the celebrated service providers of a vast number of Digital & UV Printing Services. Our service series includes Digital Textile Printing Services move, Digital Printing Services move, 3D Lenticular Printing Services that are executed with the help of latest technology based machines and tools. Use of advanced technology helps us in achieving finest quality of our services, due to which we have earned a large number of customers on the industry. From the very beginning, we have aimed to offer reliable and high quality printing services that fit the budget limit of our valuable customers. A workforce of knowledgeable and efficient professionals helps us in understanding and fulfilling the different market needs to the core. Furthermore, we make sure that best quality materials and machines are used for the execution of printing services so that the quality of the results remains uncompromised. D G Prints Fab is a trusted name in the industry that is widely acclaimed for its services that are reliable, flexible, feasible, timely executed and budget friendly. In the future, we wish to gain immense success and name in the industry by continuing to proffer a series of exceptional printing services that reach up to the mark of utmost flawlessness. We have achieved great success under the incomparable leadership of Mr. Sameer Roy. Magnificent industry experience, vast knowledge, consistent motivation and regular guidance of our mentor have enabled us to earn the trust and reliance of our precious customers. Exporter of Digital Textile Printing Material. At our company, we have hired a team of professionals, who are selected on the basis of educational qualification, years of industry experience and technical knowledge. Our workforce makes use of advanced technology for carrying out the services as per the exact requirements of our precious customers. Not only has our team worked in co-ordination with each other, but also, strived hard in the past years to earn an unmatched position the industry. In addition, we arrange several seminars and training session to upgrade the knowledge of our workforce. Ours is a reputed company that brings forth a series of flexible and feasible Printing Services. Digital textile printing services, U V digital printing service and digital textile printing is provided by us, as per the market requirements and within the promised time period. Widely appreciated in multiple textile industries for our work, we have set exampled for our peers by providing the best quality printing. Use of efficient advanced technology based machines helps us in attaining the greatest quality standards. Our services are also acclaimed for their budget friendliness and long lasting attributes. 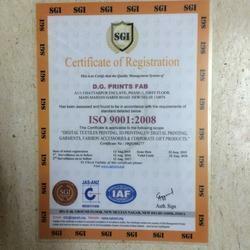 D G Prints Fab is concerned with offering the best quality printing services to its clients. We are highly acclaimed in the market for our ethical business practices, flexible & feasible services, efficient workforce and timely execution of services. In the past years of our service, we have been able to successfully proffer a perfect blend of quality and price to our esteemed customers in the industry. We wish to continue with the unmatched position that we have garnered and aim to expand our service range in the upcoming years.